I began my previous article making light of the only sure things in Walt Disney World planning being that you need to make advance dining reservations 180 days out, and that park hours will change at least once while you’re planning your trip. Well, in the Disney universe in general, there’s one more thing that’s certain: sequels. Not wanting to miss out on the lucrative market for these, I’ve decided to capitalize on the runaway box office success of my Kona Cafe post, and develop the idea into a series of posts on the topic. I’m also going to start syndicating the posts, and I will be introducing a line of merchandise soon. Who wouldn’t want some “TouringPlans.com Unheralded Dining Gem” boxers? Yeah, the idea is pure gold. For the second restaurant in our series, I decided to stay inside the monorail loop, this time making a stop at Disney’s Contemporary Resort. This one might be a bit divisive, if only for its history, because it replaced a perennial favorite in the Concourse Steakhouse. However, the past is past, and The Wave certainly qualifies both as delicious and as unheralded. If it’s “easy” to make reservations at Kona Cafe, it’s almost impossible not to be able to be seated as a walk-up to The Wave (not that I’m advocating this strategy). It seems the place is never more than half full. As with Kona Cafe, location is a big plus here. It’s a short walk from the Magic Kingdom, and while I don’t think the Contemporary offers as good of ambiance as the Polynesian, I think it compensates for that by actually being secluded from the main lobby of the Contemporary, thus keeping noise levels down. All of this makes it an excellent impromptu dinner choice when the Magic Kingdom crowds and heat begin to wear on your family on a busy summer day. It’s equally as accessible if you’re coming from Epcot and heading over to the Magic Kingdom for some Evening Extra Magic Hours. As soon as you enter the repetitive circular entrance-way of The Wave, you know you’re about to be a part of something hip. Blue lights, a bar with heavy aquatic influences, and a posh waiting area that looks like it’s straight out of an exclusive Miami nightclub (not that I would know) all greet you as you enter the restaurant. If this isn’t your scene, it might be a little intimidating at first. Based on the general lack of kids I’ve seen at The Wave, I think families with small children may actually be intimidated by the restaurant. Then, you spot the dining area, which is much more subdued but still nicely appointed, and reminiscent of a your typical Disney restaurant. The servers at The Wave reinforce the notion that The Wave fancies itself as somewhat of a trendy restaurant, explaining that the a menu is mostly sustainable and environmentally-friendly. While I think this is a great goal and I hardly criticize any company truly seeking to be a more responsible corporate citizen, part of me thinks Disney is disingenuously paying face to these ideas for the marketing and public relations benefits. It’s with claims like these that The Wave borders on eye-rolling pretentiousness. But not once does this impact the food. As far as sustainability and environmental-friendless go, don’t be scared away from The Wave if you avoid things like all-natural and organic foods because you like eating flavorful food. The Wave most certainly fits the bill as serving food with great flavor. The reason The Wave is likely most well-known is for its decision to only carry wines with screw-off tops. Among the general public, there is a misconception that screw-off top bottles of wine are one step above bagged wine in terms of quality. However, many oenophiles will tell you that screw-off tops are actually better for the wines! Since I’m hardly an oenophile (it actually sounds like a martian off the same planet as Sonny Eclipse to me! ), I can’t really speak to this, nor can I speak to the wine list at The Wave, but I have only heard great things. I do find it disappointing that at The Wave, as with almost every other Disney restaurant with an exceptional wine list, the craft beer list is fairly non-existent. Disney, there are plenty of folks out there who like to pair beer with food, maybe it’s time to start recognizing this ever-growing group of consumers? In addition to its wine list, the other stand-out among stand-outs at The Wave is its dessert menu. These are served in small groups of three, with a common theme weaved between the trio to tie them together (and give them their menu name). Here, the flavors again actually do compliment one another nicely, and come together to form (unexpected) perfect desserts. Unconventional, yes. But also delicious. This summer, when you find your blood boiling as you walk through the Great Stroller Parking Lot in Fantasyland, consider cooling off with a lunch or dinner break at The Wave. Even if you don’t have ADRs, there’s a good chance they’ll take you in! 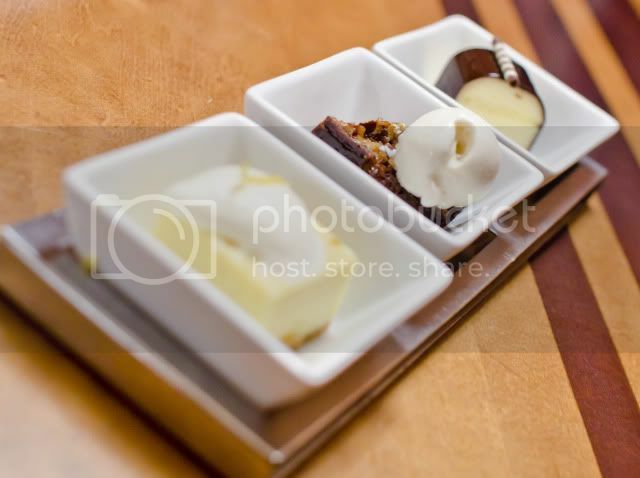 Whether you have an adventurous palate or enjoy the typical “American fare,” you won’t be sorry dining at The Wave! 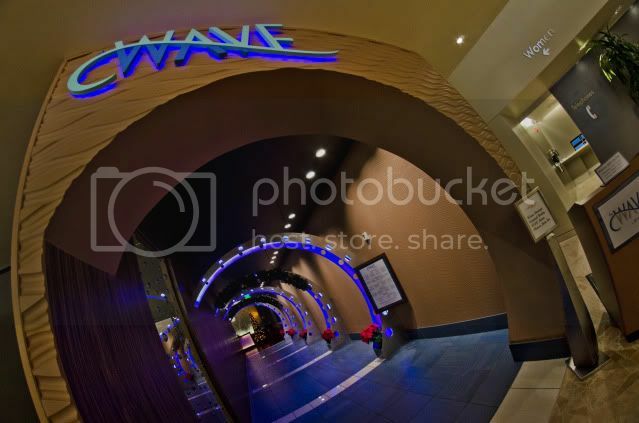 Ever tried The Wave, or still bitter over the Concourse Steakhouse? Do you love or hate The Wave? Share your thoughts on The Wave, and any other “unheralded dining gems” you may have, in the comments! Join Us For The Circus And Prizes Meet! Although I liked the restaurant, I was not a fan of the food at the Wave, it was okay at best. It is not that I would never eat there again, but there are several other places that I’d rather eat at before the Wave. What did you have when you were there? I’m wondering if maybe there are a couple dishes to avoid? It certainly doesn’t seem like The Wave is getting the kind of unanimous glowing reviews Kona Cafe got. Maybe the place IS more hit and miss than I thought? Has anyone else had a negative experience there? We haven’t ever dined at The Wave, but you do make it sound interesting. I’m going to put it on our to do list for the future. Fun article, Tom. Thanks! Wow. We enjoyed this restaurant (walk-up party of 9), although the service was slow. While I realize the author is expressing his opinion and perhaps trying to encourage those who would normally steer clear of a restaurant like this to try it, I found the tone of this article grating. Organic and all-natural foods lack flavor? Innovative food for shock value? Perhaps it’s out of place at Disney World, where some guests might consider hamburgers and french fries passable fare for a week, but for those of us used to cooking from farmers markets and eating in restaurants that serve innovative, sustainable, local food, The Wave is a welcome option. This is certainly not Disney’s only attempt to recognize that the Earth’s resources are limited and that human consumption habits are contributing to environmental degradation – perhaps if this restaurant were located in Animal Kingdom, it would seem more appropriate? I’m glad that WDW offers a wide variety of options for the diverse group of people that visit. Well, in Tom’s defense, a lot of people think of organic and natural food as cardboardy and wilted all at the same time. I see this a lot. I actually live on an organic farm and my husband is the farmer. We are also both skilled cooks and actually have the farm so as to guaranty ourselves a reliable source of uncommon varieties of fruits and veggies. I also have a lot of crunchy (as in granola-ish) friends and even farm customers who cannot cook to save their lives and try (badly) to cook their own organic meals by simply boiling organic kale, not even adding a nice bit of sea salt and calling it “good.” If that were my only experience with natural and organic food, I’d think it was nasty! We like eating at The Wave both because of its “politics” and because of the delightful preparations and variety of ingredients used. I would hope others would be open to giving it a try as it might open a few eyes. Organic and natural foods actually have more real flavor than chemical-laden, factory food, and Megan seems to know that. It’s also nice to see local and organic producers branching out, finally, and producing more than carrots, broccoli, onions, and potatoes! Keep those radish sprouts and salsify coming! There are a couple of other restaurants on property that make use of veggies off the beaten path, and not just for “shock value”–Flying Fish and bluezoo. Most upscale restaurants actually use organic veggies. You can’t produce a beautiful flavorful product if you start with substandard ingredients. I also agree that organic and local foods are amazing (I am a resident of San Francisco, arguably the most crunchy place in the country), but I also wanted to put in my two cents in defense of Tom’s article. I don’t know if you’ve read any of his past blog entries or epic trip reports, but Tom’s articles are (to me) a wonderful mix of sarcasm and whimsy (look up his Legendary Magic Kingdom Touring Plan post, definitely one of my favorites!). I could see how if you are unfamiliar with Tom’s writing style he may come off ‘grating’ as you mentioned. It may not be everyone’s cup of tea, but I enjoy the lightheartedness of Tom’s writing style (and of course the photography is legendary!). Another great article Tom! Can’t wait to try the Wave! I think you hit the nail on the head with regard to the public perception of organic. Count me among those who can’t cook to save their life (unless you count microwaving something as cooking!). Luckily, I have an amazing wife who can cook wonderfully, so I don’t have to subject myself to my terrible cooking! 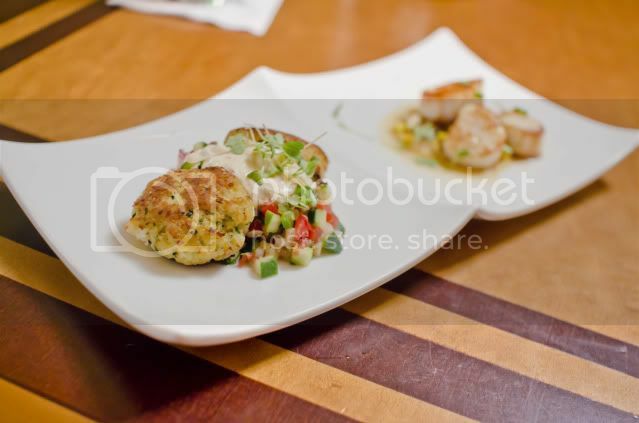 We have yet to try bluezoo (it, along with a few other Swalphin restaurants, has been on our “list” for some time), but we absolutely love Flying Fish. The menu is great, and maybe it’s just me, but it seems to get better each time we try the place. It probably won’t be the subject of an “Unheralded Dining Gems” article just because of its cost and because I think it’s pretty “heralded” but I highly recommend it, anyway. Tom’s articles are always a little tongue in cheek, so it would surprise me if he meant anything by his remarks about sustainable and organic food. If I hadn’t read all of his previous posts, then I could see how I might take his statement differently. But you know, he started his article with an offer of “dining gem” boxers. That really does set the tone for a few jokes thrown in for entertainment. I’m not contending that organic and all-natural foods lack flavor (quite the contrary as I try to eat as much all-natural food as possible, and only don’t do so on occasion due to cost); I’m suggesting to the number of people (and there are plenty of people who DO feel this way) who intentionally avoid organic and all-natural foods because they perceive that these foods don’t taste as good, that they give The Wave a shot. As far as innovative menus being offered for shock value, I absolutely do think this occurs elsewhere. It’s chic and hip right now to have edgy menus. Many chefs, it seems, try to shortcut the process by simply pairing items together that you otherwise wouldn’t expect together–without much regard for whether the pairing actually works. At The Wave, I think there are some unexpected pairings, but they’re clearly deliberate, and they *do* work. With regard to my comments about Disney being disingenuous with some of its conservation efforts elsewhere, well, I think that’s true. Disney marketing makes great efforts to showcase the efforts Disney makes to be environmentally responsible. However, there are plenty of other things Disney could do but it simply chooses not to because of the bottom line. I completely understand that Disney is a business, and must appease shareholders by making good business decisions, but it presents itself as an environmentally-responsible corporation (and in many regards, it is), so I think it has opened itself up to criticism when its conservation efforts are subpar. Good article Tom – keep them coming – you are making the planning of the ADRs easier for us! I look forward to you next review. My wife and I ate at the Wave in March and was incredibly surprised and loved it. We made ADR’s in advance and even arrived early from MK and we enjoyed getting out of the parks for an hour or two and walking around the Contemporary. I had the Beef Tenderloin and Libby had the chili rubbed flat iron steak and both entree’s were amazing and better than we had expected. I will certainly consider going back in the future. 2. While 99% of the time, a cork has no negative effect on the wine.. about 1% of the time, a cork can go bad and ruin the wine. A non issue with screw tops. As to flavor of organic and sustainable food — it has so much more flavor than the processed generic stuff you get from the supermarket. I try to mostly buy grassfed beef, and seasonal produce from the farmers market. Thanks for the insight into screw-top wines. Based upon what you’re saying, it sounds like there isn’t that great of an advantage with screw-tops (except that 1% of the time). Very interesting. I totally agree regarding organic and/or all-natural foods. My remark in the article was with regard to a stigma that exists about organic foods with the general public. With stores like Trader Joe’s and Whole Foods becoming more and more popular, I think this perception is starting to dissipate, but if you don’t live in a larger city, you may not even have access to stores that sell organic. It’s true… I live in an area where organic offerings grow by leaps and bounds. I suppose in many parts of the country, there may be suspicions tying “organic” to tree-hugging communists! Screw-tops do have a major advantage — Never having that 1-2% corkage problem, plus saving money. If I told you there was a 2% chance your Disney vacation would be ruined by hurricane… but I could cheaply eliminate that 2% risk… You would consider that to be a major advantage. I’m sure this is more information than anybody wants or needs — But corks were initially used as a strong way to seal wine, and to insure that it wasn’t tampered with. If the cork seal is broken, then you know someone has opened the bottle. But a screw top perfectly fits the bill of a closure device — it keeps the air out, and it does not interact with the wine. But much like organic food misperceptions — There is still a perception that a fine wine should have a cork. Thus, most of the top wineries are very slow to switching over. But some very fine wines do now come in screw tops. (I dare anyone to dislike Argyle Pinot Noir from Oregon). We love The Wave! Have had nothing but great experiences and great food there. We missed it our last trip, but hope to go there on our next one in a few months. Tom, I normally agree 100% with you on everything, from hating slow moving people to appreciating overlooked attractions (Hall of Prez and Peoplemover). Here, however, I have to disagree. I had dinner at the Wave in April and had to wait an extra 15 mins for my 8:30pm dinner because the place was so packed. Then my server took 10 mins just to get to me. And the food was . . . ok. I had pork with spinach and some potato thing. It was all fine, but nothing memorable or that would make me want to go back. In MK area I’d much prefer Kona, ‘Ohana, or any of the sigs. John, just out of curiosity, was this during a large convention? I have heard a couple of accounts of The Wave being busy, but it seems those reports always come during 2-3 hour dinner windows at large conventions held at the Contemporary. The rest of the time, I’ve never heard of anyone ever having a wait at The Wave. I do not think there was a convention — there were a lot of kids around. It was also late at night and a Sat during peak season, but still. I would like to go back to try the new breakfast buffet. I LOVE breakfast buffets but dislike characters, so there aren’t a lot of options at WDW. We went to The Wave last summer with 15 people ages 0-65. We had several foodies in our group, and none of us are fans of typical theme park food (it’s fine for lunch, but it’s not our favorite aspect of Disney). It was our first dinner at the resort, and I can say without exception it was everyone’s favorite meal at the resort, and that includes Kona, which we thought was just “okay” in comparison. If you like (slightly) adventurous, well prepared dishes, but non-extreme prices, The Wave is a great option. I am looking forward to this one. We are all booked up for ADR’s for our upcoming trip but NEXT TIME… The Wave! This is certainly one of the most unbelievable web logs I have read in a very long time. The amount of details in here is beautiful, as if you essentially authored the book on the subject. Your blog perfect for everybody who would like to be familiar with this kind of topic more. Great information; please continue the good work!